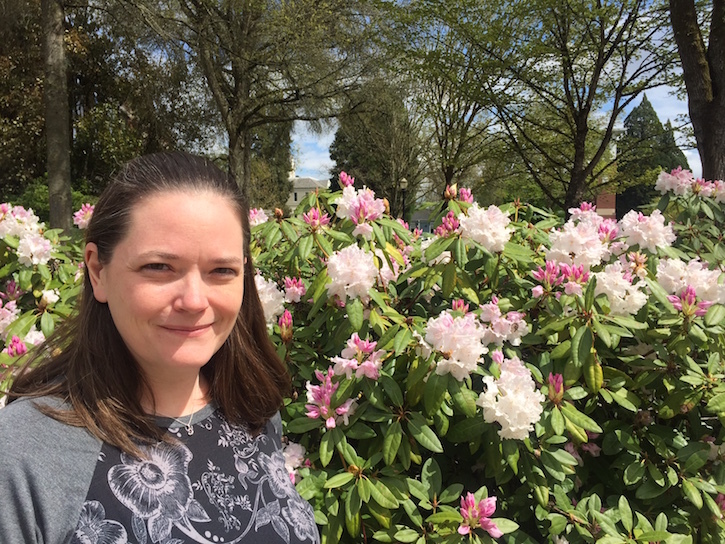 Mathematics instructor Sara Clark has dramatically improved student success in developmental math by replacing the traditional classroom model with an online adaptive learning program. In recognition of her work, she was granted a Digital Learning Innovation Award last fall from the Online Learning Consortium, the leading professional organization devoted to advancing quality in online learning, funded by the Bill and Melinda Gates Foundation. Clark was highly motivated to overhaul the two developmental math classes offered at Oregon State, Math 065 and 095 that cover elementary and intermediate algebra, because the failure and withdrawal rates were high: 40-45%. It was critical to improve this rate because the success or failure of students taking these courses has a very strong influence on subsequent student retention. And since these courses are pre-requisites to college-level math but offer no credits towards graduation, students caught in an expensive and disheartening “fail and repeat” cycle often abandon their dream of a college degree altogether. Improving Math 095 and 065 would also foster greater student equity and diversity, both strategic goals of the University. Clark found that many of the students taking developmental math courses tended to be underrepresented or first-generation students, many of whom were never advised to take math all four years of high school. As a result, many arrive at college ill-prepared, not having studied math since their sophomore year of high school and suffering from a lack of confidence. Despite these challenges, Clark knew that the high failure rate wasn’t simply because students weren’t capable of doing college-level math. The current system was working against them in several ways, she explains. First and foremost, students had vastly different skill levels entering the class. The traditional lecture-style course progressed too quickly for many students, but too slowly for others. There was no simple “teaching to the middle.” Students would stop coming to class and drop off not only because it was too hard but, for some, because they were bored, especially if they were repeating the class. Clark knew that a more individualized, self-paced course of study would be ideal for these students. But how? Fortunately, Clark was able to act quickly as she already knew of a possible solution. In 2014, Oregon State adopted Assessment and Learning in Knowledge Spaces (ALEKS) as the math placement test for new students. The advantage of ALEKS is that it is much more than just an online test—it includes modules for customized and adaptive learning based on your results. This offered a tremendous advantage to students who didn’t test into a college-level course: gaining six months of free access to ALEKS to review the material and re-take the exam. For some students, especially those who were close to mastering the material and only needed a review, this saved them much time and expense if they placed into a college-level course after taking it a second time, skipping the need for developmental math. Clark’s colleague and fellow instructor Lyn Riverstone was so impressed with ALEKS that in 2014, she did a small pilot program. Riverstone used it in a pre-calculus course designed specifically for international students who were part of the INTO program at OSU, many of whom were not 100% proficient in the English language. ALEKS allowed these students to proceed at their own pace, rather than forcing everyone on the same schedule. Based on the success of the pilot, Riverstone suggested Clark consider using ALEKS as a useful tool in developmental math. Clark quickly saw that ALEKS might be useful in developmental math courses, which also included students with varying levels of skills and abilities. ALEKS would allow students to work through the courses at their own pace, focusing their efforts exclusively on the material they needed to work on rather than wasting their time on subjects they had already mastered. At any time, students can immediately gauge their progress by reviewing a colorful online pie chart of their progress in the course (see diagram below). Colored areas represent mastery and gray areas represent areas that still need work. Rather than following a set curriculum, students select what they what to work on next in the course. The ALEKS program also constantly adapts the sequence and pace of each student’s “path.” When testing a student’s mastery, for example, ALEKS will extend a few questions beyond the boundary of the topic to challenge the student. If the student shows unusual strength, ALEKS may advance them more quickly. Likewise, any weakness will target the student for a more in-depth review of a skill or a knowledge-base that needs work. In terms of the outcome, Clark was delighted. She found that the first cohort in the fall of 2015 had a very meaningful drop in failure/withdrawal rates – from 40-45% to 14%! Clearly, ALEKS had made a huge difference, she said. The new platform not only improved learning, but was also more efficient and economical for students. The course materials were less expensive, and those who finished the material ahead of time could take the final exam early. And Math 065 students who finished early were able to move onto Math 095 in the same term, saving both time and money. Student Elijah Weiss gets coaching from Teaching Assistant Samantha McGee while Sara Clark looks on. Since then, Clark has fine-tuned the original model to further improve student success. She produced several “quick tip lectures” videos to address common areas of confusion among students. Finding that some students were progressing too slowly and only using ALEKS during the three hours of lab time each week, she added minimum weekly progress goals and hours outside of the lab. This is another advantage of ALEKS: it automatically tracks how much time students are using it. Clark also emails an encouraging Friday message to all students, which helps build community and momentum for the following week. The iterative improvements matter. The failure-withdrawal rate has dropped to 13% on average, and as low as 9-10% for the most recent cohorts. Unfortunately, Clark says, there are still students who fail the course, but with ALEKS they are essentially able to pick up where they left off when retaking it. And repeat students perform better, perhaps because they are bolstered by the sense that they’re continually making progress rather than treading over the same front-end material over and over, she speculates. Clark’s work with developmental math is part of a bigger transformation going on at Oregon State. A three-year, $515,000 initiative funded by an Association of Public and Land-grant Universities (APLU) grant is enabling educators to overhaul eight high-enrollment general education courses classrooms with adaptive and interactive learning systems. Math is one of those areas, and Clark along with project manager and Associate Dean of Undergraduate Studies Julie Greenwood are currently adapting Math 111 (college-level algebra) using ALEKS. Compared to developmental math, Math 111 will use ALEKS in more of a hybrid fashion, combining elements of a traditional classroom with online, adaptive learning. Students will move together through a curriculum of weekly topics with some live lecturing every week but still have a more individual path in terms of their online work, depending on their relative strengths. Compared to developmental math, Math 111 will use ALEKS in more of a hybrid fashion, combining elements of a traditional classroom with online, adaptive learning. Students will move through a curriculum of weekly topics with some live lecturing every week, but will still have a more individual path with their online work, depending on their relative strengths. Clark’s $10,000 Online Learning Consortium grant has been money well spent. She bought two large-sized iPads to free up her and another instructor from being deskbound to managing students’ progress online. However, she is reserving most of the money for future needs, including travel, as Clark hopes to share her progress with fellow educators across the country at future conferences and events.